George grew up in Kells and entered Trinity College in Dublin on 4 November 1782 when he was 16. He received his Bachelor of Arts degree and graduated in the Winter of 1788. (1) He is sometimes refered to with the acronym "A. M.," surely meaning "Artium Magister" (Master of Arts), indicating he continued his schooling elsewhere. He became a minister for the Church of Ireland and settled in the parish at Edgeworthstown (Mostrim), County Longford. The Keatings were close friends of the Edgeworth family, of local fame for Mr. Edgeworth's inventions and wider fame for the writings of his daugther Maria. George R. K. Smith recalled visiting his grandparents at "Mostrim Glebe," the local rectory. That and the church still stand, although the church steeple and crenellation around it were destroyed, partly by a storm (the big storm of 1839?). George and Jane are buried in the cemetery next to the church. George officiated at the wedding of his daughter Jane (Keating) Smith. 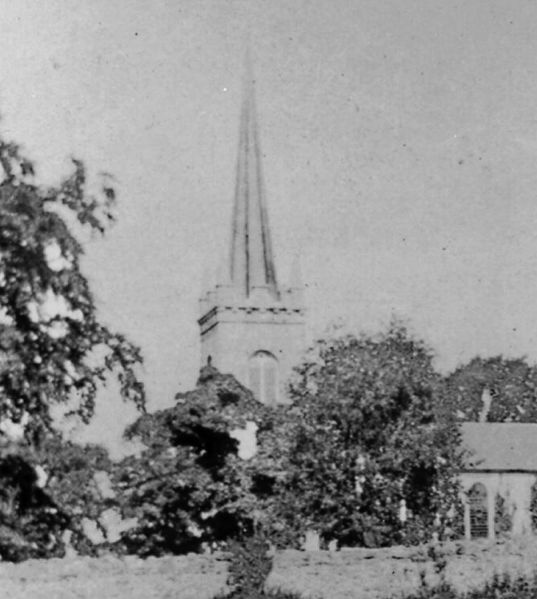 St. John's Church, Edgeworthstown, abt. 1903. Rev. George Keating was vicar here from 1801 to 1840. Robert Edgeworth, a family friend and father of author Maria Edgeworth, was an inventor. By means of ropes and pulleys he devised he had the iron spire of the church installed in less than 18 minutes. The decorative treatment on the tower, including the spire, is now gone. The author Maria Edgeworth, who was a friend of the Keating and Smith families, mentions George in an 1838 letter as an "excellent, warm-hearted man." When Sir Walter Scott visited her in 1825 they went to the Edgeworthstown school, where George was giving religious instruction to the Protestant children. George and Jane brought two of their daughters to see The Grinding Organ performed at Edgeworth House in 1809 by local players, including the Edgeworths. The Longford Journal of 1 April 1840 has death notice: "On Tuesday night, at Mostrim Glebe, Edgeworthstown, in his 74th year, the Rev. George Keating, A. M., for 39 years vicar of the parish, loved and respected by all who knew him; as a gentleman and a scholar, he had few equals, and as a Christian he recommeneded the Gospel truths by his holy and blameless life..." On the 4th of April his funeral was briefly described. The pall-bearers were Rev. George Crawford, Rev. John Le Poer Trench, Rev. Nicholas Gosselin and Rev. Anthony Lefroy Courtenay. The coffin was followed by his brother and sons-in-law, none of whom are named, near relatives and local clergy. Rev. George Shaw conducted the service and eulogy. vital records sources: George's death is calculated from his age at death given on his gravestone at St. John's churchyard, Edgeworthstown, and death notices. His marriage date is from the Keating family Bible.